A few weeks ago, Amazon made a low-key but potentially hazardous change to the backend keywords (Search Terms) fields. Supposedly, steps were taken to safeguard your keywords, but we have been contacted by clients who mention that they lost a good deal of traffic in the process. 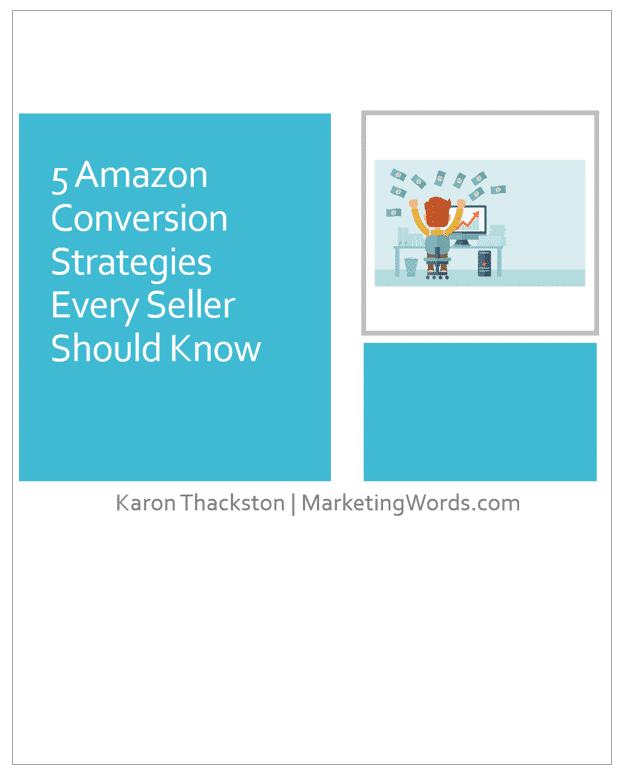 Let’s go through what was changed with regard to the Amazon backend keywords, why, and what steps you need to take now to ensure your Search Terms field is still driving shoppers to your listings. You can read about Amazon’s backend keywords update in Seller Central. Pay close attention to numbers 3, 4, and 5. Basically, Amazon removed all but 1 of the Search Terms fields that you can insert keywords into. 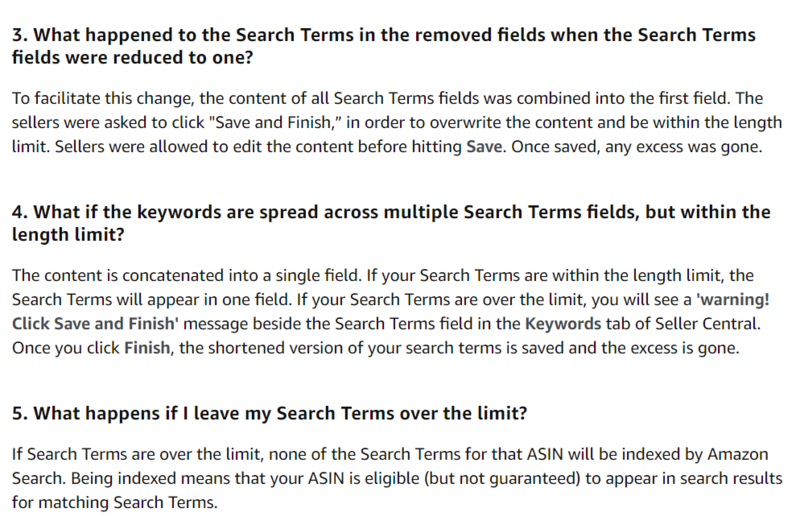 This ONLY applies to the field labeled “Search Terms.” All the other keyword fields remain the same. That seemed like a simple enough change until we started hearing from clients that their traffic had dropped. While Amazon stated that they would roll all the backend keywords from each of the previous 5 fields into the 1 field, it doesn’t look like they are doing it. Log into Amazon and check your backend keywords to verify that all the search terms you previously used are now in the 1 remaining Search Terms field. If you do not see all the keywords you previously had for your listing, insert them and save your changes. If your previous list of keywords exceeded 249 characters (including spaces), you will need to whittle it down in order to fit. If you hit or exceed 250 characters, Amazon will ignore everything in your Search Terms field. 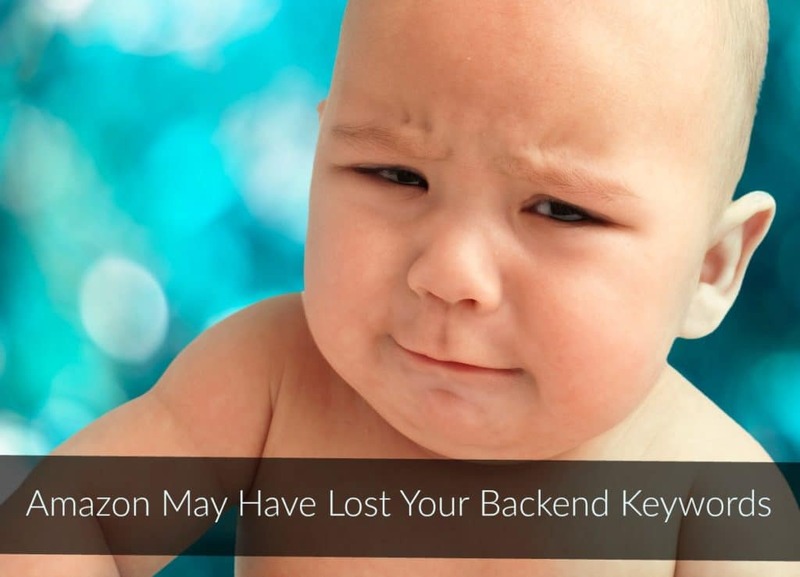 Before you begin to remove any backend keywords, make sure you have them formatted properly. Don’t duplicate keywords that are already in your title, bullets, or description section. Do not duplicate words within the Search Terms field. It isn’t necessary and wastes space. For instance, if you have a listing for a desktop calculator, you do not need to include: desktop LED calculator, calculator for desk, battery powered calculator. When you remove the duplicate words, you are left with: desktop LED calculator desk battery powered. That’s what should go into your Search Terms section (unless some of those words are already in the title, bullets, or description). I know it can be a pain to scroll through all that copy looking for words. It’s enough to give you a migraine! Here’s how we do all the de-duping for the entire listing in a matter of seconds. Helium 10 has an extremely helpful tool called Scribbles that the Marketing Words’ team uses daily when optimizing listings and Search Terms fields. Watch a video demo on YouTube and get a coupon/discount code. 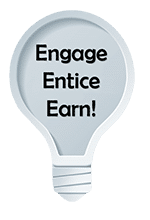 Or go directly to Helium 10 and save 10% every month on their Platinum or Diamond plans when you use coupon code MARKETINGWORDS10. Put the most important keywords closer to the front of the Search Terms field. You only have 249 characters (including spaces), so make sure you do not exceed that number or the entire field will be ignored. If you had more than 249 characters previously, you’ll need to whittle down the list. But how do you decide what to keep and what to ditch? If the keyword has already been used in any other section, you do not need it in your Amazon backend keywords. Get rid of the duplicates first. For the remaining terms, we always give preference to keywords that have a good combination of extreme relevance and high search volume. Any keywords that were previously in your Search Terms fields that are not highly relevant, that do not have good search volume, or have otherwise not proven themselves to contribute to conversions/sales should be removed. The last 249 characters are what should fill your Amazon backend keywords field. Never rely on Amazon. Always follow up behind them to make certain your listings are in good standing. When you check, I’d love for you to leave a comment below letting me know if your backend keywords were correct or if you had to make changes. Have questions about Amazon backend keywords? Ask me below. This is great info, but I have over a thousand listings. Checking and updating search terms for all my listings will take weeks if I use the “edit listing” feature. Is there a report I can download where I can edit / update the search term field of multiple listings, and then upload that file to Amazon in order to update my listings? Instructions on how to do this would be hugely helpful. Well… that is a good question. I don’t know off the top of my head. Let me see what I can find out for you. Request a Category Listings Report from Amazon. They will open up this report option for a week at a time. Download the report and populate the Search Terms1 field. (The report still showed 5 columns for keywords the last time I got one, so you may want to ask about this detail when you request the report.) Upload as a flat file, and you should be on track. Awesome! You rock! Thanks for sharing. Thanks Rosemary, I’ll give this a try! Have there been any similar changes on Vendor Central like this as well? I haven’t heard or seen anything about it happening in Vendor. Thanks for that Karen. Do you by any chance know about the Amazon ‘handmade’ platform? Amazon did not specify categories. If you click the link to Seller Central in the 3rd paragraph of the blog post, you can see the entire update. Thank you! One of my best listing had too many character – I didn’t even realize. Yikes! Glad you got it fixed. Thanks for sharing.